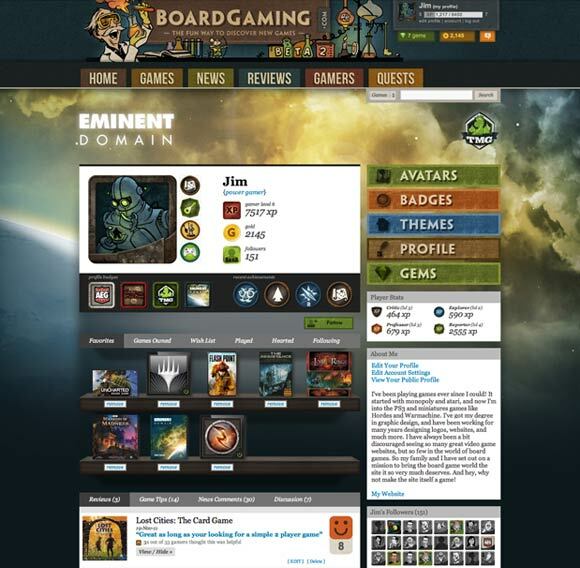 Browse through games, read game reviews, and learn about new and upcoming games. Rate games using our unique happiness scale, voice your opinions, build up your profile. 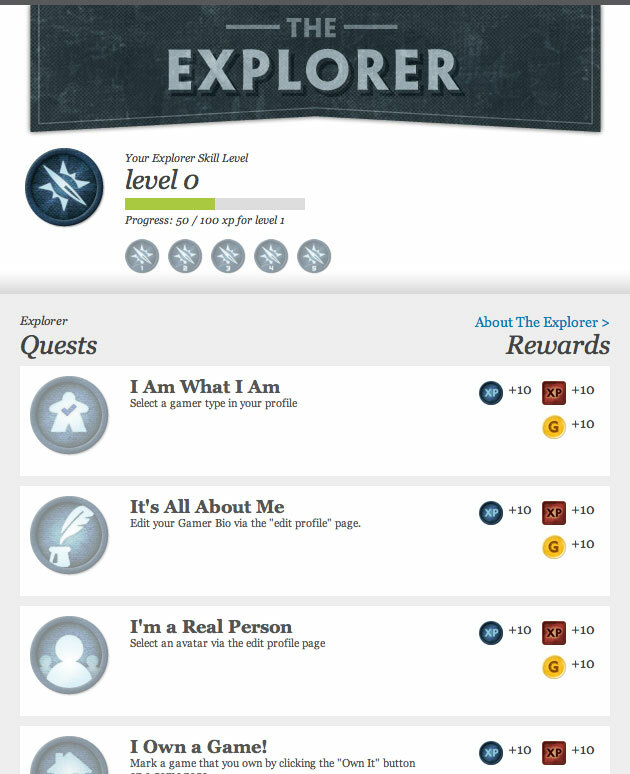 Complete quests, earn rewards, and master your skills to level-up and prove your expertise. 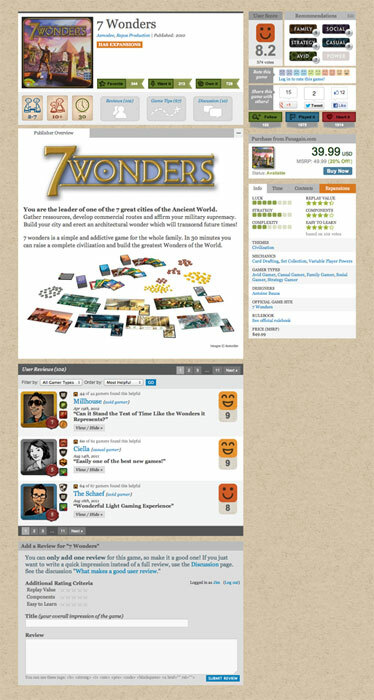 Write tips, strategies and house rules to help others take their game to a new level. I play this with the same group every year, and try to play several times outside of that. Even with new players at a full count, it’s quick–two and half hours max, shorter if everyone knows the rules. Decisions are tense and interesting. Strategies feel rewarding, and the game flows very smoothly. This game took all the things I like about modern board games (place a worker, take an action, build your engine, upgrade, manage resources, tactical movement, excellent blind auction combat, area control, exploration, just the right infusion of story and style), and combined them into one slick package. What it wants to be: Here’s an interesting category, now name 3 things (or the names for a thing) in five seconds! What it really is: An excuse to use euphemisms for genitalia. You spend more of your turn reading through several cards until you find one that’s actually interesting enough to read to another player, and hear those same three words every time a particular card is played in a game. Repeat this for every round. Easy to Learn: 5 – Read a card, say three words. Can’t get any easier than that. Overall: Can be challenging when drinking (unless you’ve played more than a couple times), boring when not. To speed things up and to add some randomness, place a random tile after each turn. You don’t place a new hotel/business if the random tile ends up adjacent to a lone tile. If the random tile ends up causing a merger, you follow the normal merger rules, except that if the sizes of the hotels/businesses are equal, you pick the buyer randomly. I really like this game, but it really frustrates the people who are impatient with other players. The chaos can be funny at first, but to play to win and to minimize frustration, focusing on moving one character at a time works well. I’m taking credit for my friend’s awesome house rule – he found that after a few plays the runes were underused. So, if no rune was taken that round, they were discarded, and new runes were revealed. There are so many rune cards, it worked out brilliantly, and we got to see more of these awesome opportunities.